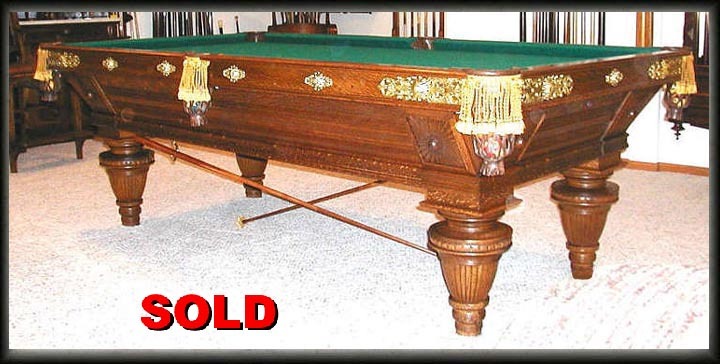 This is Brunswick Balke Collender's top-of-the-line version of the highly sought after 1880s "Union League" model pool table, and it's in the extremely hard to find 4 ft. x 8 ft. size. It's made entirely of stunning quarter-swan oak. Having consolidated with B. A. Stevens by this point, Brunswick, for a short time, continued to decorate this model and a few others with the fabulous solid brass hardware that Stevens had designed. Very reasonably priced at only $24,500, which, of course, includes new balls, 4 new cues, a triangle, a bridge, AND shipping right to your door [at any continental U. S. destination]. An incredibly luxurious table....at a VERY competitive price. We also have a fabulous, heavily carved, same-vintage oak cue rack and ball rack that could be purchased as well that are dead ringers for matching this breathtaking table. Price: SORRY, THIS TABLE HAS BEEN SOLD. Check out the accessories page and see some of the matching racks that we have available to make your room complete.